Michael Lewis is perhaps the leading writer able to expose the deepest darkest inner secrets of the financial services world, dating from his book Liar’s Poker. New York Times columnist David Brooks, in his annual “Sidney Awards” column, draws our attention to Lewis’ essay in Vanity Fair (Oct. 1), titled “Beware of Greeks Bearing Gifts”. To show how financial bungling leads to moral rot, Lewis takes us to a 1,000 year old monastery, cut off from the world, in remote northern Greece near Mount Athos, accessible only by boat. Greece’s banks and government conspired to plunder the public treasury. The Greek national railroad, lewis notes, earned 100 m. euros in revenues, but had a wage bill of 400 m. euros (!) plus 300 m. euros in other expenses. The country reported a budget deficit of 3.7 per cent of GDP, to gain EU entry, but in fact its deficit was really 14 per cent of GDP. But the real cause of Greece’s crisis was the remote monastery known as Vatopaidi. The Vatopaidi scandal brought a Socialist government to power, headed by George Papandreou, son of an eminent economist and former Prime Minister. Papandreou’s government squandered money, in ways Karamanlis would never have dreamed. Had it not been for the moral rot that touched Vatopaidi’s monastery, Lewis explains, Greece would have avoided its virtual bankruptcy. Remember the parable of how “a butterfly’s wings flap in a remote forest, and the result changes the world totally”? There is a strong similarity. An enterprising BBC reporter covered New York City’s blizzard, which dumped 75 cms. of snow (30 inches) on the city, by chatting with a New York cabbie (taxi driver). I’ve found that if you want to really know what is going on in a country, regarding its business energy and economic performance, ask a taxi driver. The same appears to be true about snow removal. Former New York Mayor John Lindsay lost his job after the Feb. 15, 1969, snowstorm dumped 15 inches of snow on New York City and paralyzed it; Lindsay was widely perceived as incompetent. Today, twice as much snow fell on New York City and within a day the city was back to normal. Cabbie Peter Franklin told BBC that Mayor Michael Blumberg reflected the spirit of New Yorkers. “The cost of snow clearance,” Franklin said, is “$1 m. per inch of snow”, or $30 m. for the 30 inches. But, he noted, “Mayor Bloomberg said, so what? So what if it costs $30 m.? Let’s just do it.” Bloomberg realized that you cannot shut down a city, and the cost of doing so, as Mayor Lindsay learned, is a thousand times more than the cost of clearing the snow. New York City simply has a method – it takes all its thousands of garbage trucks, and puts snow shovels on the front, and sends them out to clear the snow, then hires day laborers at $14/hr. and has them shovel the snow from intersections. These two simple ideas together put New York City back into commission after a very short shutdown. “To deal with problems,” cabbie Franklin says, “you need two things: Will and money. We in New York have both. So we did it.” He expressed price in the resilience of New Yorkers, and likened the snow removal to a “war” – enlisting money and energy, defining the goal (keep things functioning), and then…as the Nike mantra goes, Just Do It! Other cities would do well to benchmark New York City. Meanwhile, cities in snowy climates treat blizzards as ho-hum – Helsinki, and Toronto, and Winnipeg, Canada, for example, while a few inches in London shuts everything down and sows panic. If We Have Global Warming, Why Do We Have Global Cooling? Count on the global warming deniers to ask: if we have global warming, why do we have global cooling (freezing snowy winters in America and in Europe, closing airports, stranding travellers, and causing chaos)? And count on journalists to cover the results of the blizzards, but never to ask the core question, how are global cooling and global warming related? Fortunately, Judah Cohen, a meteorologist who works for a weather forecasting company, has written a short essay answering this question. Here is a short summary of Cohen’s explanation. 1. Even as frozen areas like the polar caps shrink, seasonal snow cover has increased, across the high latitudes of the northern Hemisphere, especially in Siberia, and the Himalayas. As global temperatures warm, Arctic sea ice melts, creating more moisture available to fall as snow. 2. The sun’s energy reflects off the snow and escapes back to space, cooling the air; this creates an “unusually large dome of cold air next to the mountains”, amplifying the standing waves in the atmosphere. 3. The increased wave energy disturbs the jet stream, which, instead of flowing mainly west to east, as it does normally, meanders more north and south. In winter, this change in snow sends warm air north, but also pushes cold air south from the arctic and from Siberia. Why did forecasts fail to predict them? “Because the primary drivers in meteorological models are the oceans, which have been warming…. They have ignored the snow in Siberia!”. It’s all a “snow job”, concludes Cohen. We’re freezing not in spite of climate change but because of it. Looks like the meteorologists’ forecast models were as wrong as the financial experts’ models. Bilahari Kausikan is Singapore’s Deputy Foreign Minister. Singapore is unique, because it attracts the very best and the brightest to its public service; most other countries practice ‘adverse selection’, which means that the best and brightest avoid poorly-paid underappreciated public service like the plague. And the realm of politics and civil service is in most countries a wasteland as a result. Singapore selects and develops its future civil servants the way Barcelona builds its stars with a youth team, starting from age 8. Kausikan has long years of experience, knows several languages, has been posted in many parts of the world, and brings a knowledge of both theory and practice to his analysis of geopolitics. He trains his own team by bringing them along on field trips to many countries. Here are a few of his insights, in an address he gave earlier this month. The U.S. has learned that it cannot, if it ever could, effectively exercise power alone. It must negotiate coalitions. These can’t be created solely by the national charm of its leaders. Unlike during the Cold War, there is no reason for nations to subordinate their national interests to U.S. leadership. So America cannot insist, but only persuade. U.S. global leadership is still irreplaceable, but is increasingly questioned. The result: A prolonged period of messiness in international relations. There will be periodic crises. The key factor that will determine whether global ‘messiness’ can be kept within manageable limits is U.S.-China relations. China is becoming more assertive in the pursuit of its interests. Global macro-economic imbalances and exchange rates are not really the core issues. The root of all crises is always political failure. US and western economies allowed their economies to deindustrialize, over 30 years, and let their financial sectors grow too big. So, for the first time, Americans and others in the West contemplate a future where living standards will probably fall. No Western government has been entirely candid with their electorates. Their tendency is to demonize an external cause. In America, this ‘demon’ is becoming China. The slightest short-term improvement of the economy in the US or Europe will be seized upon to declare permanent victory, leading a slow slide back to old bad habits. For the EU, it will be a very long time before it becomes more than a rhetorical global geopolitical force. The key players will be the US and China. All other players will be side shows. In Asia, all the major powers (India, China, Japan) are seeking a new modus vivendi with each other. None of this is easy. The outcome of Asian architecture will profoundly influence future global architecture. Southeast Asia has little to unite it; its only intrinsic characteristic is diversity. And the emerging East Asia architecture will affect US-China relations, which in turn drive future global architecture. The bottom line of this analysis? Asia is crucial globally, not solely because of its growing economic muscle, but also because of its rising geopolitical power. Of course, economic and political power are closely interconnected. I think the crucial question is: Will Asia look inward and create its own Single Market, as the EU did, or will it seek to create an Asia-oriented global architecture? No-one knows the answer. The result will impact all of our lives. A growing number of companies known for their hard-nosed approach to business—such as GE, Google, IBM, Intel, Johnson & Johnson, Nestlé, Unilever, and Wal-Mart—have already embarked on important efforts to create shared value by reconceiving the intersection between society and corporate performance. Yet our recognition of the transformative power of shared value is still in its genesis. Realizing it will require leaders and managers to develop new skills and knowledge—such as a far deeper appreciation of societal needs, a greater understanding of the true bases of company productivity, and the ability to collaborate across profit/nonprofit boundaries. And government must learn how to regulate in ways that enable shared value rather than work against it. Capitalism is an unparalleled vehicle for meeting human needs, improving efficiency, creating jobs, and building wealth. But a narrow conception of capitalism has prevented business from harnessing its full potential to meet society’s broader challenges. The opportunities have been there all along but have been overlooked. Businesses acting as businesses, not as charitable donors, are the most powerful force for addressing the pressing issues we face. The moment for a new conception of capitalism is now; society’s needs are large and growing, while customers, employees, and a new generation of young people are asking business to step up. Porter’s “shared value” is in fact not innovation, but ‘retrovation’. It is how capitalism used to be run, before the narrow-minded selfish financial wizards of Wall St. shanghaied it. See my blog about Scott Paper’s CEO Thomas McCabe [“McCabe’s Credo”, Aug. 6 2010]. It is high time we reverted to it, as capitalism once was. Perhaps thought leaders like Porter can accelerate this process. Here is Porter’s checklist, to determine how your organization can create shared value. Could our product design incorporate greater social benefits? Are we serving all the communities that would benefit from our products? Do our processes and logistical approaches maximize efficiencies in energy and water use? Could our new plant be constructed in a way that achieves greater community impact? How are gaps in our cluster holding back our efficiency and speed of innovation? How could we enhance our community as a business location? If sites are comparable economically, at which one will the local community benefit the most? Large organizations invariably struggle with innovation, precisely because of their size. The anonymity and bureaucracy of ‘scale’ are enemies of creativity. It is hard to find big companies, indeed, that are dynamically creative. Apple may be an exception. But after achieving market capitalization of almost $300 b., some analysts wonder whether Apple is truly big enough (about 37,000 employees) to generate sustained growth and profitability. One solution companies are adopting is outsourcing. Find consultants who will come up with the ideas, just as you find Chinese factories who will do your manufacturing. Such organizations are JUMP, IDEO, or Kotter International, do such consulting. * For example, Procter & Gamble, known as an organization that puts huge stress in its strategic planning on innovation, employs JUMP, to help study the “future of water and its water-dependent products, like detergent”. MARS asked JUMP to help study the current meaning of “indulgence”. GE retained JUMP for 10 different projects. There is an alternative to outsourcing innovation. It is this: Take ownership of the innovation process, at the CEO level. Put together a task force. Use consultants only when the project, issues, and success criteria, are clearly defined. The objective: Build a personalized creativity/innovation machine, suited to your organization’s culture, history, personality, competencies and goals. Like a fingerprint, this creativity machine will be, MUST be, unique. And only you, the organization, can build it. Others may help – but the organization’s leaders must take ownership of the innovation process, building and operating it. For this reason, I like the approach of Prof. Vijay Govindarajan, an innovation expert who will not even call himself a consultant. He is author of The Other Side of Innovation. “Consultants solve problems,” he says. “What I want is for companies to self-diagnose their problems and self-discover their own solutions through my thought leadership”. I have helped companies work on constructing their innovation processes, and often, find there is an Act Two problem –an initial world-changing innovation, followed by immense difficulty in repeating it, precisely because no well-defined innovation process, aligned with the company’s goals and culture, has been put in place, even while every other imagineable process has been organized and defined in an operations manual. Companies – Build your own personal Creativity Process. If you succeed, it will create a torrent of powerful innovations. If you fail, or do not even bother, other organizations who do will eat your lunch. Five years ago, Bill Gates made an extraordinary announcement. He invited the world’s top scientists to define the world’s biggest health problems, and then to tackle them, and provided nearly half a billion dollars in five-year grants for 43 proposals (out of a total of 1,500), through the Bill and Melinda Gates Foundation. Now, five years later, Gates has brought the grant-receiving scientists together in Seattle to evaluate the results. Frankly, they are not good. For instance, the pursuit of vaccines that do not need refrigeration (scarce in poor countries) has failed. Says Gates: “On drawing attention to ways that lives might be saved through scientific advances, I’d give us an ‘A’!” But, he continues, “I thought some [breakthroughs] would be saving lives by now, and it’ll be more like in 10 years from now.” If then. In some ways, Gates’ medical philanthropy mimics Microsoft’s innovation philosophy. Microsoft never misses an opportunity to miss an opportunity. It missed the iPad revolution, and now announces it is coming out with its own version of iPad, using its massive cash reserves to fund expensive “catch-up innovation”. But throwing money at innovation, large amounts of money, can be self-defeating, because the very existence of money precludes some of the wonderful creativity driven by the very lack of money. The core paradox here is this: How do you fund worthy innovation projects, without ruining them with that very funding? How do you apply former Curitiba Mayor Jaime Lerner’s dictum, which he applied religiously, that if you want innovation, slash two zero’s off the budget? Gates is now shifting his strategy. 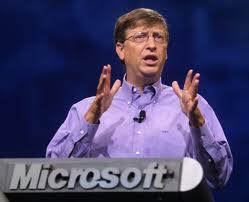 Like Microsoft, Gates makes mistakes but usually learns from them. His plan now is to make hundreds of smaller, $100,000 grants. Mimicking Nature, Gates hopes that a thousand experiments will eventually turn up one or two breakthroughs. Of course, we all wish him well and admire his philanthropy. I wonder if Gates and his foundation might have made better progress and saved hundreds of millions of dollars, had he thought more carefully about the nature of creativity and innovation, and its ambiguous connection with money. * based on: Donald McNeil Jr., “Taking stock of a health quest”, IHT Dec. 21/2010, p.1. Two key innovation principles joined together, to save the lives of prematurely-born babies in developing countries. One is the desperation of having no money – leading to superheated inventiveness and creativity. The second is the wisdom of looking back to old ideas, rather than constantly seeking technology-intensive expensive new ones, which I call “retrovation”. Here is the story. Dr. Edgar Rey, chief of pediatrics at Mother & Child Institute, Bogota, Colombia, was desperate. Toward the end of the 1970s, Dr. Rey had a desperate shortage of incubators for premature babies. At times, three babies were crowded into one incubator, spreading infection. Even when alone, “preemies” tend to do poorly in incubators. One reason, Dr. Rey felt, was that preemies were separated from their mothers when in incubators. Let’s be creative, he reasoned. Incubators keep babies warm, oxygenated and nourished. Just like the womb. What else can do this job, without costly equipment? How about – mothers? Dr. Rey invented “kangaroo care” – here is how it works. A mother of a preemie puts the baby on her exposed chest, dressed only in a diaper and a cap, upright or semi-upright, strapped in by a scarf or other cloth sling supporting its bottom, all but its head covered by mom’s shirt. The mother keeps the baby like that, skin-to-skin, even when sleeping in a reclining chair. Fathers can wear the baby too, to give Mom a break. The babies stay warm, their own temperature regulated by the sympathetic biological responses that occur when mother and infant are in close contact. The mother’s breasts heat up or cool down, depending on what the baby needs. Feeling the mother’s breathing and heartbeat helps babies stabilize their own heart and respiratory rates. They sleep more. They can breastfeed at will. Preemies simply do better with “kangaroo”, according to randomized clinical research. “Kangaroo” is basically how mothers care for babies in “poor” countries that cannot afford technology, and how mothers cared for babies through history. By looking “backward”, both in terms of history and in terms of technological sophistication, a major breakthrough was achieved. One of the careful clinical trials of “kangaroo” was conducted here in Israel, at Nahariya Hospital. Tina Rosenberg, “The human incubator”, Global New York Times, Friday Dec. 17, 2010, p. 6. My friend David Frank, a rising blogger who has significant experience in US bond markets, provides evidence that Fed Chair Bernanke’s QE2 (quantitative easing, version 2) has failed. Since the program began in November, 5-year-yields (the yield on five-year US treasury bonds) have risen by a very large 0.9 percentage points (90 basis points). This means that the Fed has taken a $3 b. capital loss on the $116 b. worth of bonds it bought, because their prices have fallen, making their current value only $113 b. This is not the key point – the point is, QE2 was aimed at LOWERING long-term interest rates, and apparently it has done the opposite. Frank attributes the core problem to lack of coordination between the White House and the Fed — not the first time. The White House, by embracing the Republicans ‘ beloved extension of the ‘tax cuts for the rich’ program, has created even more red ink and postponed even further dealing with America’s near-11 per cent of GDP deficit. This means the Federal government will need to sell even MORE bonds in future to pay for its deficits – and by the laws of supply and demand, higher supply means lower prices (and higher bond yields). It is not at all surprising, given the actors in place now in the Obama Administration, that the Treasury is acting at odds with the Fed. But it is distressing – because the Fed is the World’s Central Bank, not just America, and at the moment, it is bring mismanaged, as is the US Treasury, to the detriment not only of the rest of us outside the US but to the detriment of ordinary Americans as well. Secret Bankers’ Meeting: Is This Restraint of Trade or What? Take senior business leaders from nine top companies in a vital industry. Arrange for them to meet on the third Wednesday of every month in New York. Purpose of the meeting: Protect their monopoly on an enormously profitable product. Secrecy: “the details of the meeting and identities of the participants have been strictly confidential”. Question: Does this qualify for breaking the law, under America’s anti-trust legislation, or what? In her front-page exposé in the Global New York Times “Secret group keeps grip on trading derivatives” [Monday Dec. 13 2010], Louise Story reveals how top global banks “fought to block other banks from entering the market [for derivatives], and are also trying to thwart efforts to make full information on prices and fees freely available. Let me get this straight. The huge, unregulated global derivatives market, including CDS’s (credit default swaps, that destroyed AIG), created by the huge banks, almost destroyed the global economy during 2007-9. The same people who brought you the Global Crisis Act One are now conspiring in secret to recreate it and keep it alive – the very assets that caused ordinary working people all over the world enormous grief and job loss. Why are they doing this? Apparently, according to Story, because the derivatives market is hugely profitable, precisely because it is secret, unregulated, and no-one knows for sure how much the banks are charging legitimate companies for the vital hedging activities that derivatives permit. How do we know it is enormously profitable? Checked the banks’ P&L statements lately? Wondered where all that profit is coming from, in a weak economy, with limited bank lending and borrowing? Two sources: Derivatives, and speculative trading. The global banks failed to truly destroy global capital markets in their first try. Perhaps this time, unless they are brought under control, they will succeed. For the record, the bankers who meet secretly are: Thomas J. Benison, JP Morgan Chase; James Hill, Morgan Stanley; Sthanassios Diplas, Deutsche Bank; Paul Hamill, UBS; Paul Mitrokostas, Barclays; Andy Hubbard, Credit Suisse; Oliver Frankel, Goldman Sachs; Ali Balali, Bank of America; Biswarup Chatterjee, Citigroup. Note that it was JP Morgan who invented credit default swaps in the first place. Ostensibly they meet to manage a “clearing house” for derivatives. In practice, they are effective in keeping out newcomers, including respected banks including Bank of New York-Mellon Clearing. “Fundamentally the banks are not good at self-regulation”, said a former Federal Reserve regulator Theo Lubke who oversaw derivatives review until last autumn. Here, we have the hands-down winner for Understatement of the Year!